Pictured Above:Major John Wimsatt with PSC professor, Jorie Favreau. “Balance, that would be the biggest struggle,” Major John Wimsatt of New Hampshire Fish and Game, told me as we sat at lunch and I pried him about his time on the force. 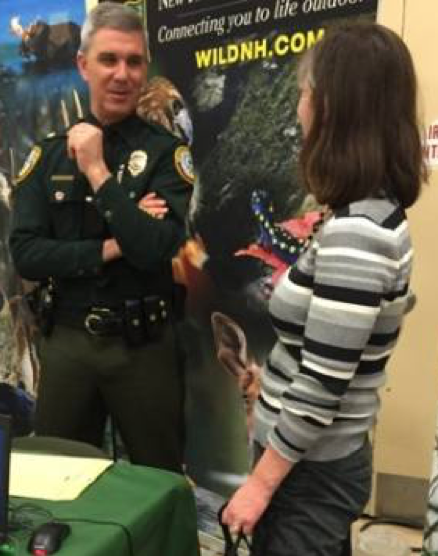 He and Conservation Officer Kevin Bronson, also with New Hampshire Fish and Game, had come to Paul Smith’s College to host a seminar on just what it is they do as Fish and Game officers in the rural New England state. But I wanted to know more about what being on the force meant to them and how they got to where they are. The Major was 22 when he joined the force. He had an Associate’s Degree in Conservation Law Enforcement from Unity College. His love for the outdoors was sculpted through years spent hunting and fishing. He also told me of a neighbor he had growing up that was a conservation officer, and when the time came that he was of age and positions were open, Major Wimsatt applied for his chance to be a part of what he calls, “one of the finest fish and wildlife law enforcement agencies in the country.” Being a New Hampshire native myself and having had the opportunity to meet and work with members of the department over the years, I would have to agree with that statement. Unlike the New York DEC and other state environmental law agencies, New Hampshire Fish and Game has specialized teams, such as their dive team, which is the only state dive team in New Hampshire, and their SAR, the Search and Rescue crew. In New York State it’s the forest rangers that conduct the SARs. New Hampshire Fish and Game offers a variety of work atmospheres, from patrolling dense forests to hiking Mt. Washington to cruising the coast, all of which can happen in a matter of hours depending on the day. In New York you’re likely to end up in NYC for your first four, maybe five years before an opportunity to transfer opens up. However, New Hampshire being so rural, there’s a better chance you can get to where you want to be sooner. Officer Bronson, a New York native, made the move to the Granite State because of the opportunities it had to offer. “I was interested in both environmental law and search and rescue,” Bronson said. It was the fact that New Hampshire Fish and Game gave him the opportunity to do both that helped to sway his decision for the move. His advice to those looking to get into the same line of work is, “Find what you want to do, find the differences between the states because there are plenty, and apply to all states that you would accept employment in.” In his five years on the force, it took him three to get to where he wanted to be, which just happens to be my old stomping grounds of the Sullivan County area. It was intriguing to meet an officer in his early years on the department, and one who has worked his way up the ranks, and to be able to compare how similar and how different they are. When asked what his biggest struggle so far had been, Officer Bronson said, his age. “I’m 26, but I look younger. When it comes to hunting and fishing violations with older generations, I’m frequently confronted with, ‘I’ve been hunting and fishing longer than you’ve been alive.’” Officer Bronson said that he isn’t the type to get into a confrontation, “I just tell them, ‘I have a job to do.’” It was especially hard stepping into a new territory and taking over another officer’s position in an area like the one he is in now. Sullivan County is filled with small towns where everyone knows each other and word spreads faster than weeds can sprout. “No one knew me,” he said, but the area knew the previous officer quite well. Officer Bronson has set a goal for himself of getting to know the people before he ever has to have a negative interaction with them. 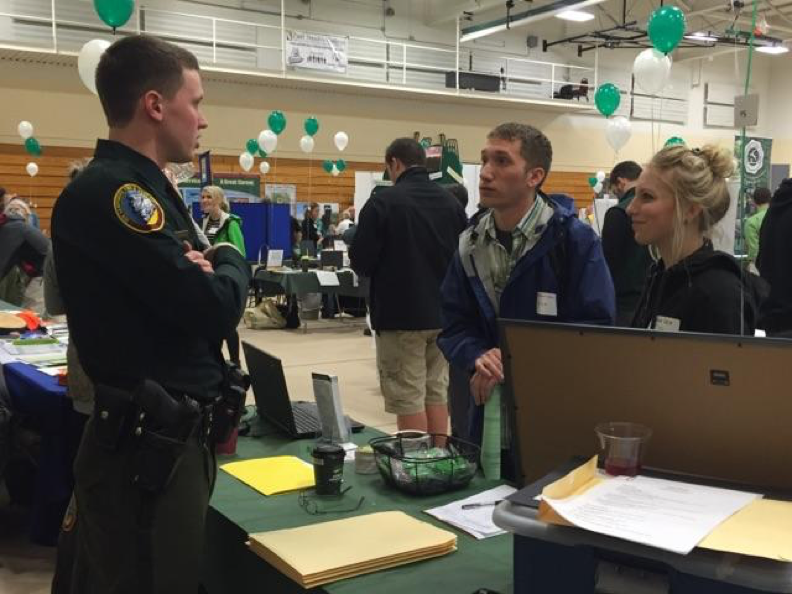 Officer Kevin Bronson discussing the job with PSC students Shawn Boland and Cat Leist. It was their difference in response to my question that really illustrated to me just where they both were in their careers. Major Wimsatt had been an assistant dive team leader, a member of the advanced search and rescue team for New Hampshire Fish and Game, an Emergency Operation Center search and rescue leader, and more, throughout the years. When I asked why he no longer did as much with those groups, his answer came back to the balancing act. Not only is he a Conservation Officer Major, Major Wimsatt is also the Assistant Chief of Law Enforcement. These positions hold a lot of responsibility, just as being an official in any department does. It didn’t leave him the time necessary to put towards those specialty crews and, most importantly, his family. “When you’re young you can bull through, but as you grow you force yourself to prioritize. Sometimes, you just need to say ‘no.’” Major Wimsatt said, “It’s okay to be selfish with free time.” He said he sees a lot of guys who don’t believe there is such a thing as working too much, and end up leaving no time for the things they love to do. The Major said he wasn’t about to let anything stop him from spending time with his family, and participating in the activities that shaped his love for the outdoors and brought him to where he is today. However, in roughly 13 months, finding free time won’t be a problem anymore for the Major, as he has announced his retirement. While he will be greatly missed, there is no doubt that he has earned it through his years of hard work and dedication to the state and its residents. The Major won’t stay retired for long though he informed me, “I’ll probably still have another 10-year career after this.” However, he said he does owe a portion of that time-off to his wife. 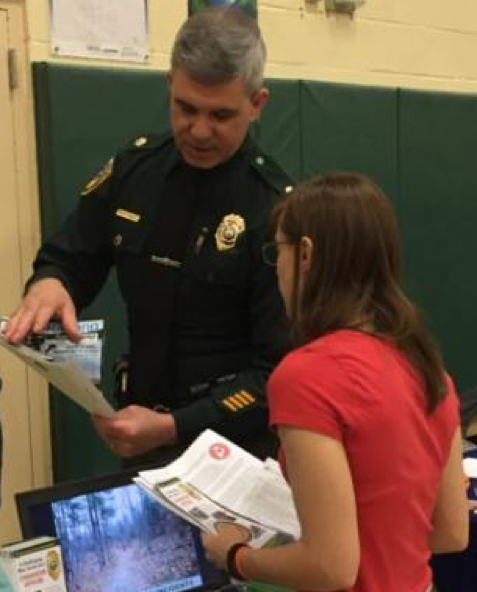 Officer Bronson and the other Fish and Game officers will have some big shoes to fill, but I have no doubt New Hampshire Fish and Game will continue to thrive in the years to come. My name is Kate Marsh (many know me as Katie). I am a junior at Paul Smith’s College, studying Natural Resource Management and Policy and Fisheries and Wildlife Sciences. 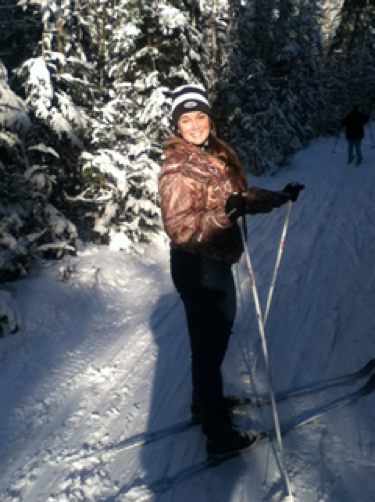 I have a deep love for winter and all that it has to offer. Growing up in New Hampshire, my favorite pastime was breaking trail on my first snowmobile, a 1995 440 Jag by Arctic Cat. It had no reverse and shoddy brakes, but that added to the adventure. I’m a member of the women’s rugby team here at PSC and want to welcome anyone interested in joining us for some fun anytime.